If needed, sand wooden letters to make them smooth. 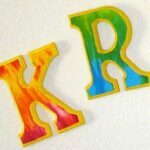 You can find wooden letters at most craft supply stores or order them online. Paint a coat of Liquitex Basics Gesso on each letter. This is a craft medium that will help provide better coverage and will require less yellow paint. This step is optional, or you may choose to use white acrylic paint if you don't have any gesso handy. Allow to dry completely. Paint all letters with yellow craft paint, allow to dry and repeat. Once paint is completely dry, lay letters on work surface in front of you. Cut sections of tie dye fabric large enough to completely cover each letter. Each letter should have its own piece of tie dye fabric. Mix together equal parts of water and white craft glue, mixture should have a milky and paintable consistency. Use an old paint brush to apply a coat of glue mixture onto raised surface of the letter where you want the fabric to be. Lay the fabric onto the glue mixture and gently press down. Use old paintbrush to paint another coat of glue mixture over the top of the fabric, thus decoupaging the fabric on. Repeat these steps for each letter and allow to dry completely before moving on to the next step, at least 2-3 hours. Using a box cutter or razor blade, cut away the excess fabric by stretching out the excess fabric with your fingers and cutting along the edge of the raised letter. To stretch fabric out, gently pull fabric away from the glued edge until taut, then use the box cutter to trim away. Turn each letter over and hammer a nail-less sawtooth picture hanger into the back for hanging on the wall. For letters with two "tops" or longer top edges such as "K" or "T", use 2 hangers. Hang your tie dye letters on the wall! This project for Make Tie Dye Wall Letters was printed from CraftsbyAmanda.com - https://craftsbyamanda.com/make-tie-dye-wall-letters/ and can only be printed for education or personal use.